This portable, rechargeable unit from the makers of the Total Shield is suitable for a room of approximately 100 square feet. It produces a 7.83 Hz field (the Earth's natural field, also called the Schumann Resonance), protecting you from electrical and electronic devices such as computers and TVs. Charge it for 12 hours and it will last for 40 hours. Ideal for travel. Comes with AC adapter (compatible with 110 and 220V); measures 2 3/8"W x 3 3/4"L x 1"D; weighs 4.1 ounces. The 4X unit is four times stronger than the regular model; the battery charge does not last as long so it will need to be charged more often. The 4X unit has one LED, while the regular unit has 3 LEDs. 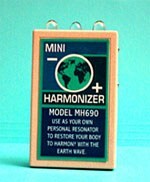 Click here to download the Mini Harmonizer manual. Going on 4 years of flawless protection. Daughter is debilitated by EMF due to leaking cerebral spinal fluid even after blood patches....took years to figure it out. She carries this whenever she leaves home. Protects her from her work computers and big city power lines that crisscross every road !! She uses the largest Total Shield at home since a massive power line is nearby. She can live her life again!! Used for a few months, then left on the shelf for a few months after a complete battery drain. Now the battery won't charge for more than a few minutes of use. I can't even drain it all the way any longer. It will go a few minutes, stop, then I have to wait for several minutes before trying it again. Same scenario over and over for 2 weeks. Can't charge it, can't drain it. Worthless. And when I emailed CutCat from their website for help, I got NO RESPONSE..............................................................................................................CUTCAT RESPONDS: We checked our old emails, but can’t find one from you about this issue. We apologize that you received a unit that isn’t working. These units are warrantied for a year. We wish you had called us about this soon after the problem started; this was posted almost two years after you purchased it. We will call you to discuss this in more detail.